I volunteered to start this series of short videos to help Lost and Found Theatre promote the world premiere of Pocket Rocket a new play by Lea Daniel and Gary Kirkham. Checkout the Lost and Found Theatre blog to get a peek behind the scenes of the video series and the play. I know it’s taboo, but I’m going to talk about money. In particular I’m going to talk about the money I received last week from the Ontario Art Council through it Exhibition Assistance program. I’ve tentatively arrived at the “career” of artist as I navigate my middle years – a journey partly of necessity and partly of design. I’m emerging as an artist, so to be validated by the province’s premier arts granting body is cause for celebration. It’s a milestone coupled to my time as Kitchener’s Artist in Residence in 2014. The grant is based on recommendations by local arts organizations, usually galleries or artist-run centres who assess applicants and suggest funding to the OAC. I applied through the Kitchener-Waterloo Art Gallery and its senior curator Crystal Mowry for support for the final exhibition of my Kitchener residency project called Neighbourhood Voices in the Rotunda Gallery at City Hall. Although the application for exhibition assistance is quite simple, the idea of it was daunting. Writing an application to someone you know, someone you see regularly at openings, someone who has THE creds in a world in which you are a newcomer, someone such as Crystal Mowry, is way harder than writing for a faceless, nameless jury – at least I thought so. Since entering into the community of art makers in Waterloo Region, I’m surprised regularly by the generosity of my colleagues – a willingness to share ideas, experience and work. So, I shouldn’t have been surprised by the mentorship so willingly offered by Crystal in the application process. Preparing the application was less work than other grant applications I’ve been involved with, but Crystal’s attention to detail and insistence on proper form gave me more valuable take-ways than any grant writing workshop I’ve attend. Average income for Canadian artists from all sources is a little over $31,000 annually; so, funds granted by the Ontario Arts Council are crucial to enabling artists to create and exhibit their work. Equally important though, is the networks and development of art making in individual communities nurtured by these grants. 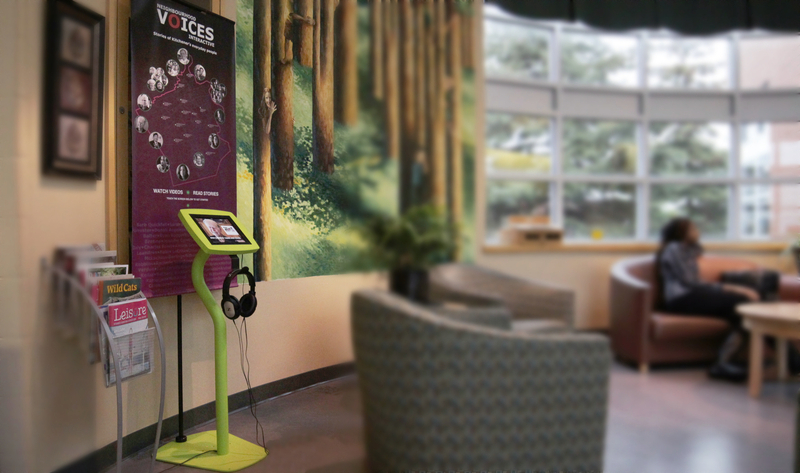 As part of my residency at the City of Kitchener in 2014 I developed an interactive video installation for two gallery shows that gave visitors the chance to mix together two of the video stories I created as part of the year-long project, Neighbourhood Voice. The mixing of the stories creates both resonance and dissonance with the lives of the people both in the story and the viewer. This deepens the connection between the viewer in the storytelling and creates a unique of the of the stories each time they are played. I intentionally paired the stories to reveal my reflection of filming and editing each of the story and intersection of the experiences. The storytellers – a 90-something war veteran and 30-something full-time mom – in the video below are both deeply connected to their community, but in vastly different ways. How they choose to play out their connect offers insight into the passage of time, the importance of symbols and moments in our lives connect us to the place where we live. The video is an example of the how one person experienced these stories. 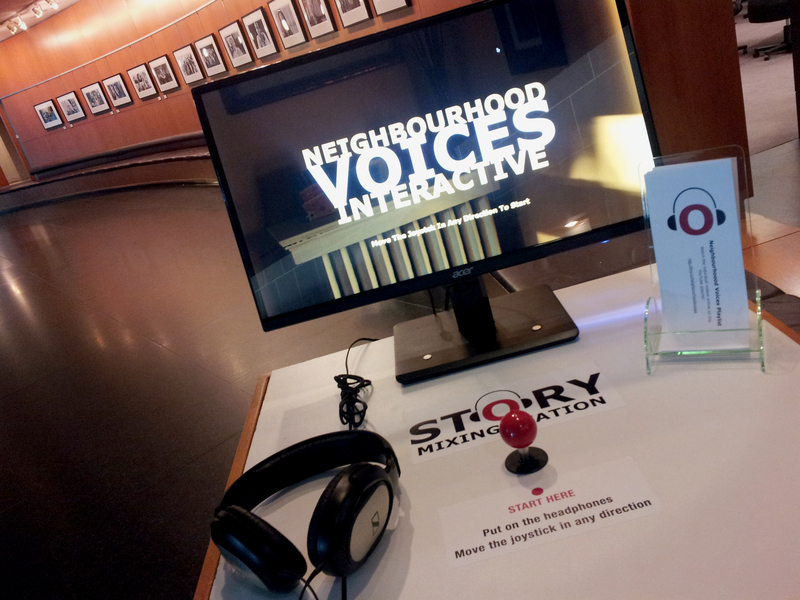 For more Neighourhood Voices checkout the series playlist on my Recent Videos page.